Home » Advice and Information » Curious or Interesting, all the anes from Methane, through Propane to Heptane. I will say up front I am not a Chemist but do have a little science background. So today when my gas ran out it got me thinking what is the difference between Propane and Butane? Looking into it soon took me back to my electronics theory class regarding Valence electrons. You don’t need to understand any of that stuff to find the rest of this article curious or interesting however. Think of it as a real world QI episode relevant to motorhomes. Ok, you probably know that both of these gases are Hydrocarbons in gas form. Dinosaur farts if you like. Hydrocarbon is simply a term for substances that are totally made from hydrogen and carbon molecules. From high school classes you probably remember that an atom is made up of a core of Protons and Neutrons and then in orbit around this core is a bunch of electrons. The electrons have different orbits with some closer to the core and some farther out. The ones in the outer orbit are able to be shared with other atoms and form what is called covalent bonds. Ok, started to get a bit too technical there. Imagine that the core of an atom is a football, and the electrons are golf balls in orbit about the football like our moon orbits the earth. Except there is more than one moon in orbit. Some of these electrons orbit closer and some further away. The ones in the outermost shell are able to move between one football and the one next one. This is how electricity works, through the flow of electrons. It is also the way that atoms bond to each other to form molecules. When 2 atoms share an electron they form a bond and become a molecule. Different atoms have a different number of protons/Neutrons and electrons. This is what makes them different from each other. Keeping this limited to Hydrocarbons, Hydrogen has 1 Proton and 1 Electron. Carbon is the most amazing element and has 6 Protons, 6 Neutrons and 6 Electrons. 4 of these 6 Electrons are in the valency shell. Sorry got a bit technical again there. We are now to the interesting bit. Carbon will form a bond with 4 other atoms due to these 4 valency electrons in the outermost shell (orbit). These bonds can be to other carbon atoms to form stuff like coal, graphite and diamonds. However they can also connect to other atoms such as hydrogen. Now hydrogen has only one electron so can only attach to a single carbon atom each. If you connect 4 Hydrogen to 1 carbon atom like this you have Methane the simplest of all Hydrocarbon molecules. It is called CH4 because it has 1Carbon and 4Hydrogen. This is what you will know as natural gas. And yes this is also the stuff in farts for the kids at the back of the class. Carbon is black and hydrogen is white in this picture. The next thing you can do is join 2 carbon atoms together which will leave 6 valency electrons spare, attach a hydrogen atom to each and you get C2H6. 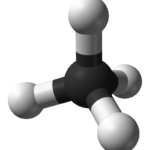 This is called Ethane and looks like this. Now we get to the ones, we are interested in. If we join 3 Carbon atoms together you will be left with 8 valency electrons spare, attach a hydrogen atom to each and you get C3H8. This is called Propane. Are you seeing a pattern yet? CH2, C2H4 and C3H6? Carrying on like this the pattern goes, C4H8, C5H10, C6H12 and C7H14. These are called in order Butane, Pentane, Hexane and Heptane. So the difference between Propane and Butane is 1 Carbon atom and 2 Hydrogen atoms. The other thing that is worth knowing is there are intermolecular forces at work these are called van der Waals forces. These van der Waals forces are greater when the molecules are bigger. This leads to a higher boiling point as the molecules get bigger. There are other things that can affect it but to keep it simple…. So a Butane molecule is bigger than a Propane molecule so has a higher boiling point. In your motorhome you use the gas form that has ‘boiled’ off from the surface of the liquid propane/butane in your tank. Butane’s boiling point is -1°C so if the temperature gets down to this then the Butane will stop boiling off and you won’t get your gas. 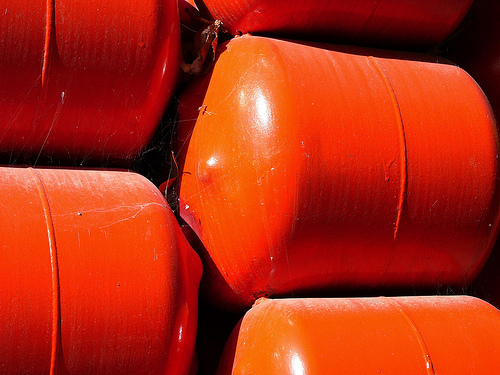 Propane’s boiling point is -42°C so is better suited to cold conditions. Why don’t we just use propane all year? Well many of us do, however Butane does have the advantage that it has a very high energy capacity in comparison to Propane. Natural Gas (Methane / CH4) – which is delivered to your home by the gas mains has 38 Mega Joules of Energy per cubic metre. Propane (C3H8) produces 96 Megajoules of energy per cubic metre. 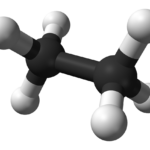 Butane (C4H10), produces 126 Megajoules of energy per cubic metre – far more than either natural gas or propane. So in a perfect world you want to be carrying Butane around with you. However if the temperature drops to close to 0°C you want to move to Propane. Anyway, I found this curious and interesting so thought I would share it. Please note a lot of this is simplified for ease of understanding and is not entirely accurate. You would need to learn about things like Ions, Isotopes, Alkanes, Alkenes, Alkynes and much more. However for the purpose of this article the above is enough to understand the basics. Please leave any comments below.